Was birth-related medical malpractice responsible for an injury or other damages to your family? An experienced lawyer specializing in obstetric negligence cases can help you determine whether your child was injured by the negligence of a member of your labor and delivery team. Our Portland medical malpractice law firm is seasoned in labor and delivery malpractice cases and provides legal services for families throughout Oregon and Southwest Washington. For a free consultation about your potential damages claim, contact Miller & Wagner in Portland. Serious injuries or disabilities in infants may be the result of medical errors during prenatal testing, labor and delivery, or neonatal care. Birth trauma cases are perhaps the most complex and challenging type of medical malpractice claim. It is particularly important the lawyer you choose to represent you and your child be highly skilled in handling this specific type of case. 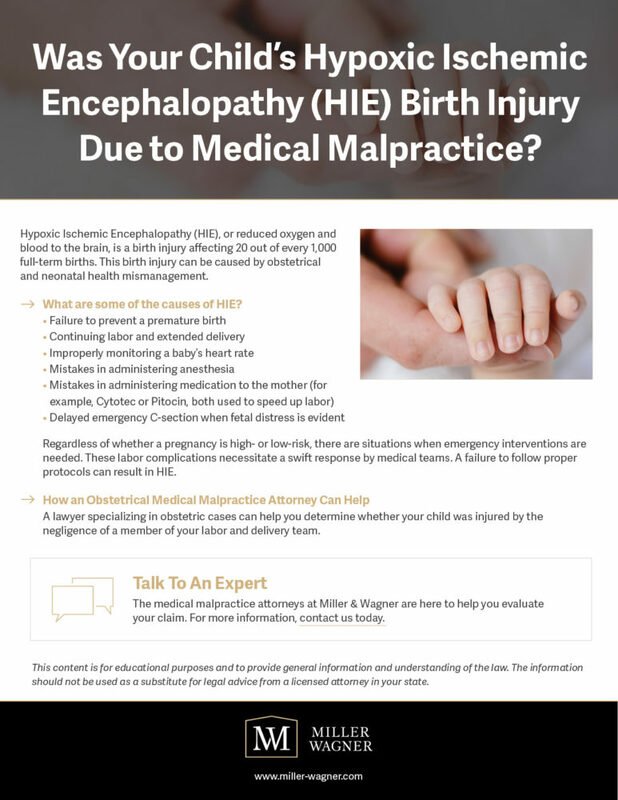 Other types of birth-related medical malpractice damages include fetal distress, water birth injuries, traumatic nerve damage, brachial palsy, umbilical cord errors, facial paralysis, fractures, cephalohematoma, and caput succedaneum. Cerebral Palsy refers to several types of neurological disorders that can result in issues with muscle coordination and movement. Thousands of these cases are a result of preventable medical malpractice, such as failure to respond to fetal stress and obstetrical negligence. Hypoxic-Ischemic Encephalopathy (HIE) is a result of oxygen deprivation and is a leading cause of death or impairment among infants. Often the severity of the impairment cannot be determined until a child is a toddler. Impairment can include developmental delay, epilepsy, and cognitive impairment. Infant seizures can be due to an underlying medical problem, or the the result of a birth-related injury. They can manifest after birth or during the neonatal period. The most common cause of seizures in infants is due to oxygen deprivation. Other causes can be prolonged labor and delivery and infections. Brachial palsy occurs when nerves are torn or dislodged upon forceful extraction of a baby during birth. This type of birth injury is associated with a group of shoulder joint nerves known as the brachial plexus which control upper arm function. Fetal distress refers to many potential symptoms during the birth process. These health problems may include a slowed or rapid heart rate, decreased movement in the birth canal, elevated blood lactate levels, and the presence of meconium in the amniotic fluid. Traumatic nerve injuries may occur when babies are not properly monitored as they pass through the birth canal. During labor, an infant’s body is subject to various stresses that can cause serious nerve damage. Infants may incur severe brain damage or other injuries during a water birth. Although the American Congress of Obstetricians and Gynecologists (ACOG) warns against water births, many hospitals still offer this type of labor plan. Obstetric negligence can result in additional injuries as well. Extended periods of inadequate oxygenation may result in cerebral palsy, and brain damage. Delays in ordering a C-section can require high-risk surgical extraction as well as a wide range of potential injuries to the baby. Improper attention to electronic fetal monitoring strips can result in a delayed reaction to fetal distress. Our Portland law firm specializes in birth injury claims in Oregon and Southwest Washington. The birth injury attorneys at Miller & Wagner represent medical malpractice clients throughout the Pacific Northwest including Portland, Vancouver, Salem, and Bend. For your convenience, we also have a satellite office in Eugene. If your infant was injured as a result of birth-related medical malpractice in Portland or the surrounding areas, a medical negligence lawyer from our firm can help you get started with a claim.